LOS ANGELES -- A former JetBlue flight attendant accused of trying to sneak a suitcase full of cocaine through Los Angeles International Airport and making a dramatic dash to escape is set to plead guilty in the case in federal court on Monday. Marsha Gay Reynolds is expected to plead guilty to conspiracy to possess and distribute cocaine in federal court, according to court documents. A conviction on that charge carries a mandatory minimum of 10 years in prison. Reynolds, a U.S. citizen and resident of Queens, New York, is a former Jamaican beauty queen and New York University track athlete. 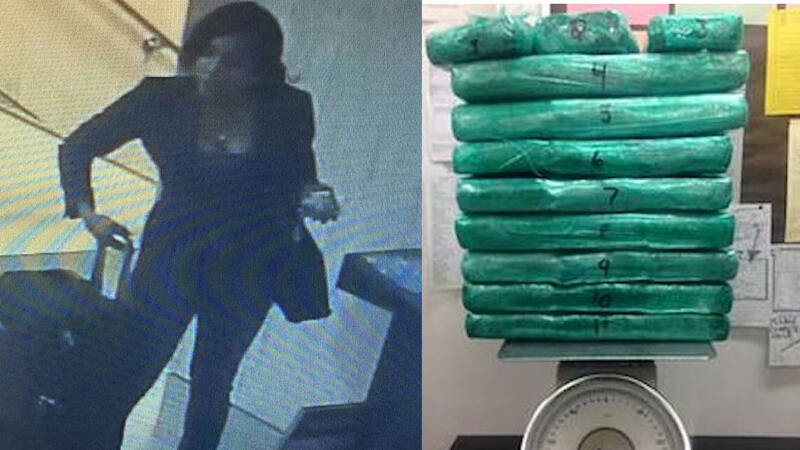 Authorities said they found 70 pounds of cocaine in her luggage at LAX on March 18 after she was flagged for a random security screening, flung off her high heels and bolted barefoot down an upward-moving escalator. They said she ran out of the terminal and made her way to New York. Reynolds, 31 at the time, surrendered in New York days later. An attorney for Reynolds at the time said she might not have been sure what was in her bag. A court document filed by prosecutors on Friday said for the first time that Reynolds was getting paid thousands of dollars to help smuggle drugs and money through airport security at LAX and John F. Kennedy International Airport in New York. An unindicted and unnamed co-conspirator illegally in the U.S. would give Reynolds the cocaine and money, and she would use her "known crew member badge" to get them through security, after which she would give them back to the co-conspirator, according to the document. The co-conspirator fled to Jamaica, according to the document.